Second-year coach Tom Herman promised in 2016 the Longhorns would again play for championships, but even he admitted Monday the program has taken a leap faster than he expected when he took over before the 2017 season. No. 9 Texas (9-3) returns to the Big 12 title game Saturday against No. 4 Oklahoma (11-1) in a rematch of the Longhorns’ 48-45 win back in October. In a way, Texas is indeed “back” after years of despair. Everything quickly unraveled when McCoy got hurt in the first quarter of a loss to Alabama — a game that started Nick Saban’s dynasty with the Crimson Tide — and the malaise rolled over into 2010 when Texas went 5-6, Brown’s only losing season in Austin. Brown bailed enough water to keep Texas from sinking completely, but a succession of four- and five-loss seasons followed. And he couldn’t stop a growing sense of frustration that Texas no longer was considered elite. Brown got pushed out after the 2013 season despite taking the Longhorns to within half a game of winning at least a share of the Big 12 title. After losing to Baylor in the season finale, Brown was gone and Texas lost its bowl game to finish 8-5. 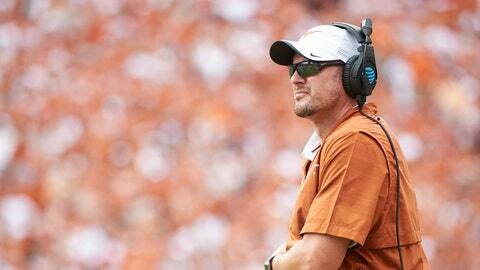 The Longhorns wouldn’t win eight games again for five years. Turmoil raged throughout three straight losing seasons. The school parted ways with unpopular athletic director Steve Patterson and seemed adrift. Patterson made the bold move of hiring Strong, the school’s first African-American head football coach, when he lured him away from a successful run at Louisville. Strong’s record of 16-24 made him the first coach in program history to have three consecutive losing seasons. Texas then plucked Herman out of Houston, where he’d become one of the hottest young coach in college football. The results on the field didn’t change much. Texas went 7-6 in Herman’s first season in 2017, but got its first bowl win since 2012. This season started with a dud when Texas lost the opener at Maryland and it looked like more of the same. Herman vowed that loss wouldn’t define the season and his players backed him up by winning their next six games, including a thriller over the rival Sooners. “We had a plan, and just because we went 7-6 doesn’t mean that the plan is broke. The plan just needed more time,” Herman said. First-year athletic director Chris Del Conte didn’t hire Herman but has seen the impact winning football can have on an entire program. As soon as the season is finished, Texas will start on a $100 million stadium and football field house renovation.